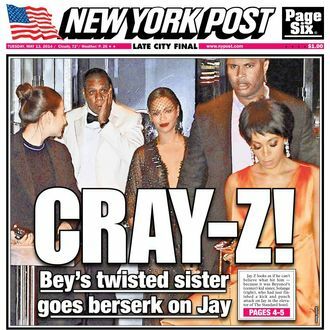 Jay Z has 99 problems, one of which is the New York Post’s insistence on making the same joke about Shawn Carter’s numerous anxieties over and over again. Here are the many offenses, listed in chronological order. Lovers of the English language with weak immune systems may want to refrain from reading the post in its entirety. The New York Daily News is also responsible in this crime against words, having made similar jokes at least 11 times. The “99 Problems” references are so ingrained in American culture that the phrase can be divorced from Jay Z entirely. Mitt Romney, Pope Francis, Obamacare, Hamid Karzai, footballers, Oz: The Great and Powerful, Iggy Azalea, and the MTA have all been diagnosed with 99 problems. However, the strange epidemic of “99 problems” has not been worrisome enough to prompt medical inquiry.